August 22 , by Barbe Saint John. If you have had some fun making some shrink plastic jewelry, theres always a pile of scrap leftover. You don’t want to throw it away, but what can you do with it??? 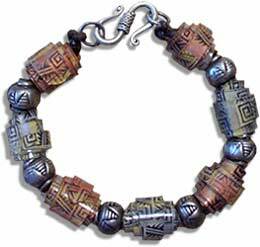 Â Well, Rubber Stamp club shows you how to use those scraps and make bead with them. I think that you could use irregular shaped pieces of scrap not just perfect triangles, and have some interesting organic beads.Â If you can’t find it locally, you can buy it online thru Lucky Squirrel and other craft suppliers.